Bronchiolitis is the leading cause of admissions in children less than two years of age. It has been recognized as highly debated for many decades. Despite the abundance of literature and the well-recognized importance of palivizumab in the high risk groups, and despite the existence of numerous, high-quality, recent guidelines on bronchiolitis, the number of admissions continues to increase. Only supportive therapy and few therapeutic interventions are evidence based and proved to be effective. Since Respiratory Syncytial Virus (RSV) is the major cause of bronchiolitis, we will focus on this virus mostly in high risk groups like the premature babies and children with chronic lung disease and cardiac abnormalities. Further, the prevention of RSV with palivizumab in the high risk groups is effective and well known since 1998; we will discuss the updated criteria for allocating infants to this treatment, as this medication is expensive and should be utilized in the best condition. Usually, diagnosis of bronchiolitis is not challenging, however there has been historically no universally accepted and validated scoring system to assess the severity of the condition. Severe RSV, especially in high risk children, is unique because it can cause serious respiratory sequelae. Currently there is no effective curative treatment for bronchiolitis. The utility of different therapeutic interventions is worth a discussion. The prevalence of chronic obstructive pulmonary disease in Saudi Arabia is 4.2% among the general population and 14.2% among smokers. Studies showed that management of respiratory diseases is inadequate. In this article, we have elaborated on how factors as health economic factors, lack of health-care providers, culture, attitude, lifestyle (such as smoking and physical inactivity), and lack of adherence to the evidence-based practice guidelines may influence chronic respiratory disease management in Saudi Arabia. We have to conclude that these factors should be taken into account while seeking to improve and optimize the quality of care for patients with respiratory diseases in Saudi Arabia. CONTEXT AND AIM: The skeleton is a frequent site for metastasis in patients with breast, lung, and prostate cancer. Bone metastasis compromises skeletal integrity leading to skeletal-related events (SREs). This study aims at estimating the prevalence of bone metastasis in lung cancer and describing types of bone involvement, management, outcomes, and overall survival. METHODS: We retrospectively reviewed the charts of 259 patients with nonsmall cell lung cancer who consulted the Department of Medical Oncology at our institution between January 2002 and December 2012. We documented their lung cancer characteristics, presence of skeletal metastases, management types, outcome parameters, and survival status. RESULTS: A total of 116 patients (58.6%) were diagnosed with bone metastasis. The most common site of metastasis was the spine. The most common SREs were bone pain (44%) and need for radiotherapy (25.9%). Patients with adenocarcinoma (P = 0.002) and concomitant liver metastasis (P = 0.013) tended to have more incidence of bone metastasis. Survival rates were (36%) at 1 year, and (3%) at 5 years. Metastasis to the bone did not impact patients' survival. Patients tended to have worse survival in the presence of concomitant bone and liver metastases (P = 0.012), older age (P = 0.024), lower limb metastasis (P = 0.014), hypercalcemia (P = 0.001), and not receiving calcium therapy (P = 0.011). CONCLUSION: Metastatic bone disease is considered a huge burden on patients, clinicians, and the society. The majority of bone metastasis patients will experience SREs. Most SREs predict poor prognosis. Supportive therapy to overcome the reasons for poor prognosis may improve patients' survival and quality of life. BACKGROUND: It is unclear whether inhaled corticosteroids (ICS) have chemopreventive effect on lung cancer (LC) development in humans. 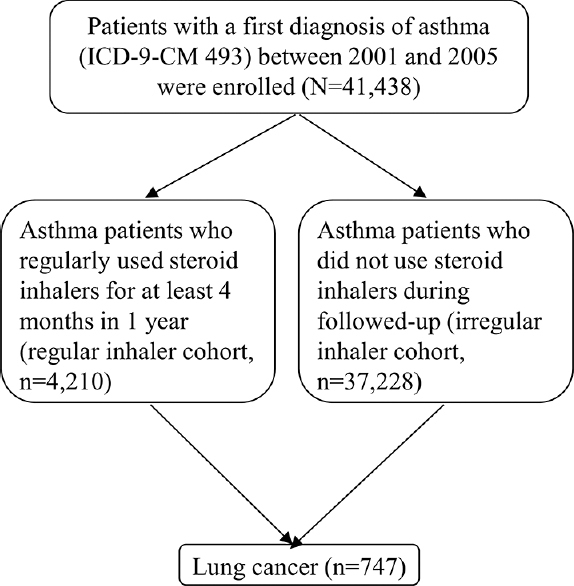 We investigated the association between the ICS use in asthma patients and the risk of LC. METHODS: We conducted a nationwide, population-based retrospective cohort study using the National Health Insurance database. We identified 4210 asthmatics who were initially free of LC and regularly used ICS between 2001 and 2005 and 37,228 asthmatics without regular ICS use. Patients with documented history of tobacco use were excluded from the analyses. Asthmatics were categorized into a mild and a severe asthma group. Each patient was tracked until the end of 2010 to identify incident cases of LC. Cox proportional hazards models were used to evaluate the effect of ICS on the risk of LC, further stratifying by asthma severity and comorbidities. RESULTS: During follow-up, we identified 747 incident cases of LC diagnosed in the asthma cohort. Compared with severe asthmatics without regular ICS use, the risk of LC for those with mild asthma with regular ICS use was lower (adjusted hazard ratio = 0.42, 95% confidence interval = 0.31–0.56, P < 0.0001). The risk of LC was calculated among the following rankings of risk severe asthma without regular ICS use, low severity without regular ICS, high severity with regular ICS, and low severity with regular ICS group showed a decreasing trend of LC incidence (P = 0.041). Analyses stratified by comorbidities revealed that the protective effect of ICS was assessed with better precision and more pronounced in those with renal diseases, stroke, and hyperlipidemia. CONCLUSIONS: For patients with asthma, regular ICS use might have a protective effect against LC. 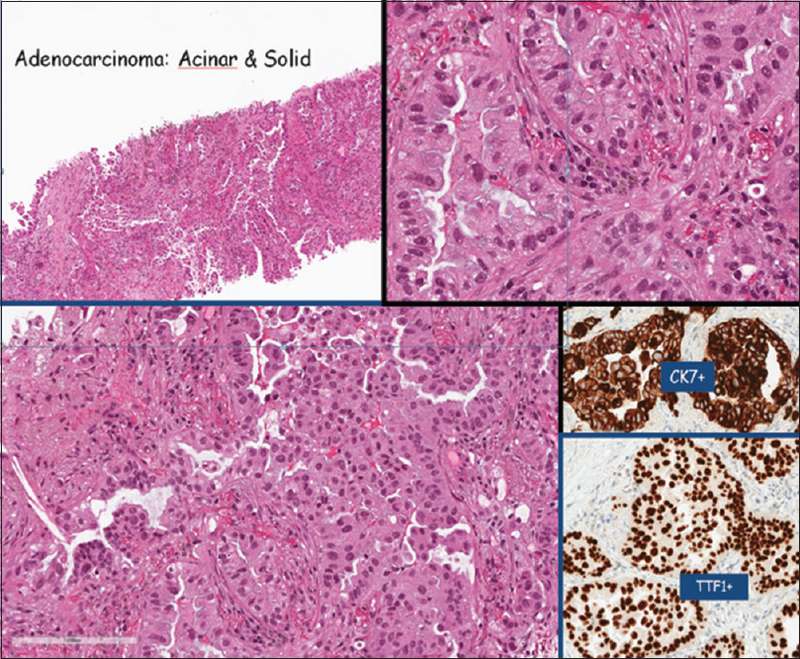 Further studies are required to assess this potential association from both immunohistopathological and clinical aspects. 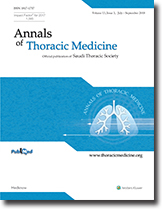 OBJECTIVE: The aim of the present study was to report our patients with pulmonary siderosis (PS) who were exposed to iron oxide and diagnosed with the minimally invasive surgical technique (video-assisted thoracic surgery [VATS]), and to provide a discussion of the relevant literature. METHODS: Hospital records of seven patients who were diagnosed with PS by VATS between 2008 and 2016 were retrospectively reviewed. VATS was performed for seven patients for whom no definitive diagnosis could be made with other diagnostic techniques. RESULTS: All 7 patients included in our study were male, and their mean age was 54 years. As for the profession, two patients were founders, two were grinders, and three were welders. All patients were operated with VATS. The patients were followed with chest radiograms and spirometric tests for an average of 24 (15–36) months. At the follow-up, the patients were not only free of progression but also they even showed regression. CONCLUSION: VATS is currently an established technique used for many diagnostic and therapeutic procedures, notably in chest surgery practice. We also advocate that VATS technique is an ideal method for making the pathological diagnosis of pneumoconioses when other methods fail to do so. INTRODUCTION: Recently, sleeping disorders and snoring are being recognized as a public health concern with various risk factors and health consequences. The main objective of the present study was to determine the prevalence of snoring and sleep apnea among adults (20–60 years) in Sharjah (United Arab Emirates, UAE) and assess the major risk factors as well as the general knowledge among the population. METHODS: A self-administrated Questionnaire of five sections including both Berlin questionnaire (BQ) and the Epworth Sleepiness Scales (ESS) were given to a randomly selected population in Sharjah between the ages of 20–60 years. Data were analyzed using SPSS software version 22.0. RESULTS: Nearly 34.2% of the study population reported to be snorers, and 43.2% of snorers were at high risk of sleep apnea based on the BQ. Gender was significantly associated with snoring (P = 0.038), as 40.8% of males reported snoring compared to 28.7% of females. Elderlies (50–60 years) were at a higher risk, and obesity (body mass index >30) was considered to be a powerful risk factor as 46.8% of the obese participants reported snoring. Those who scored higher on the ESS were more likely to be snorers (P = 0.001) and were likely to fall into the high-risk category in the BQ (P = 0.007). In addition, smoking (P = 0.005), hypertension (P = 0.005), and nasal septal deviation (P = 0.024) were also considered as risk factors. CONCLUSION: Prevalence and major risk factors within the UAE are similar to those in other countries. Sleeping disorders and snoring campaigns and management facilities should be considered to raise the awareness about these issues and manage their risk factors. INTRODUCTION: Restless legs syndrome (RLS) is etiologically divided into primary and secondary syndromes. However, a comparative description of both types is lacking in the literature. We compared primary and secondary RLS with respect to demographic determinants, associated risk factors, and comorbidities. 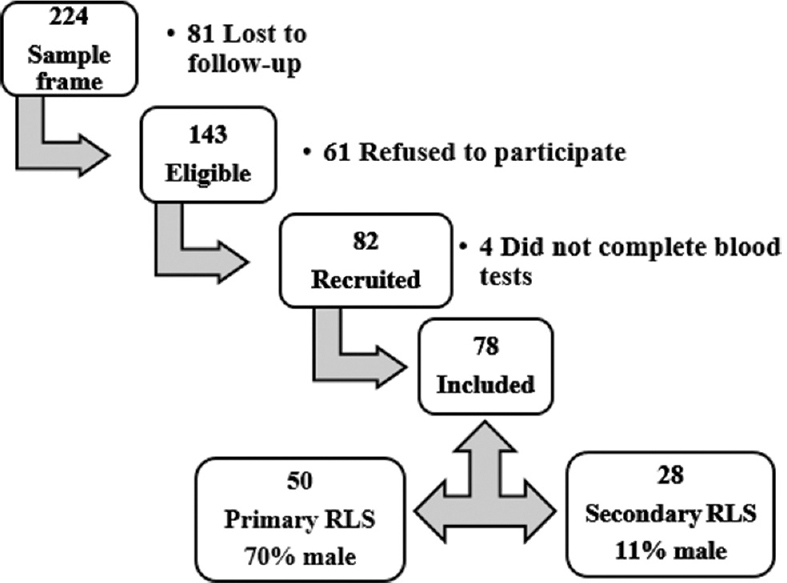 METHODS: Following a cross-sectional survey on the prevalence of RLS in a Saudi population, RLS cases were identified using the International RLS Study Group (IRLSSG) criteria. Cases were assessed with an interview-based questionnaire regarding baseline characteristics, risk factors, and comorbidities and with lower limb examinations and laboratory measurements. RLS severity was assessed using the IRLSSG Severity Rating Scale. RESULTS: In total, 78 patients with RLS, including 50 (64.1%) primary and 28 (35.9%) secondary cases, were examined. Of the primary cases, 35 (70%) were male; of the secondary cases, 25 (89.3%) were female (P < 0.001). Multivariate regression confirmed the association of male gender with primary RLS (odds ratio = 14.53, 95% confidence interval [2.9–75], P = 0.001). There were more dark- and black-skinned participants in the primary RLS group (38, 72%) than in the secondary group (15, 28%) (P = 0.042). Iron deficiency was observed in most (26, 92%) of the secondary cases. More severe symptoms were reported in secondary than in primary RLS cases (P < 0.05). CONCLUSIONS: Primary RLS is more common but less severe than secondary RLS. Male gender and ethnicity play significant roles in primary RLS, whereas female gender and iron deficiency may be the main risk factors associated with secondary RLS. 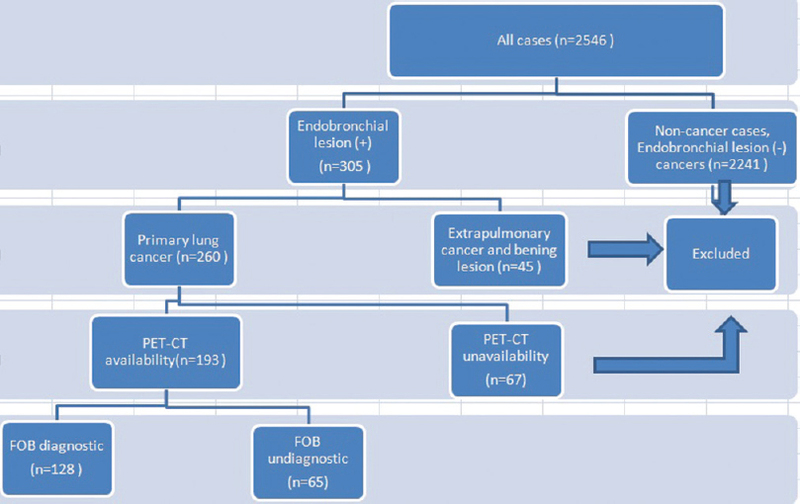 PURPOSE: The purpose of this study is to investigate the effect of homogeneous/heterogeneous (necrotic) involvement and maximum standardized uptake value (SUVmax) value of the lesion on positron emission tomography-computed tomography (PET-CT) of patients who underwent fiberoptic bronchoscopy (FOB) for prediagnosis of lung cancer and biopsy for endobronchial lesion on the diagnostic success of biopsy procedure. METHODS: Between January 2014 and December 2016, patients with final diagnosis of pulmonary malignancy as determined by FOB biopsy and patients who failed to be diagnosed by FOB biopsy and diagnosed with pulmonary malignancy by a different diagnostic method were examined. These patients were divided into two groups as those with diagnosis by FOB biopsy (Group 1) and those who failed to be diagnosed by this method and diagnosed with pulmonary malignancy by a different diagnostic method (Group 2). The SUVmax values of the two groups were compared with lesion characteristics of homogeneous, heterogeneous involvement/presence of necrotic component as shown by PET-CT. Group data were assessed by Chi-square test and Mann–Whitney U-test. In all tests, P < 0.05 was considered significant. FINDINGS: A total of 193 participants with a mean age of 61 ± 9.4 were included in the study. There were 128 (66.3%) cases in Group 1 and 65 (33.7%) cases in Group 2. The mean SUVmax value was 16.4 in Group 1 and 15.1 in Group 2. There was no statistically significant difference between the two groups (P = 0.329). Homogeneous involvement was present in 103 (80.3%) cases in Group 1 versus 42 (64.6%) cases in Group 2. In the presence of homogeneous PET-CT involvement, diagnosis rate by biopsy was significantly higher (P = 0.016). CONCLUSION: We concluded that the high SUVmax value of the mass lesion on PET-CT did not increase the diagnostic value of the biopsy procedure in patients prediagnosed with lung cancer and that the diagnostic success of FOB biopsy was poor in cases where PET-CT showed heterogeneous involvement of the mass lesion. Schistosoma is a parasitic infection that affects many people worldwide. However, pulmonary Schistosomiasis is very rare entity which defined as pulmonary involvement develops in persons living or travelling in endemic areas. 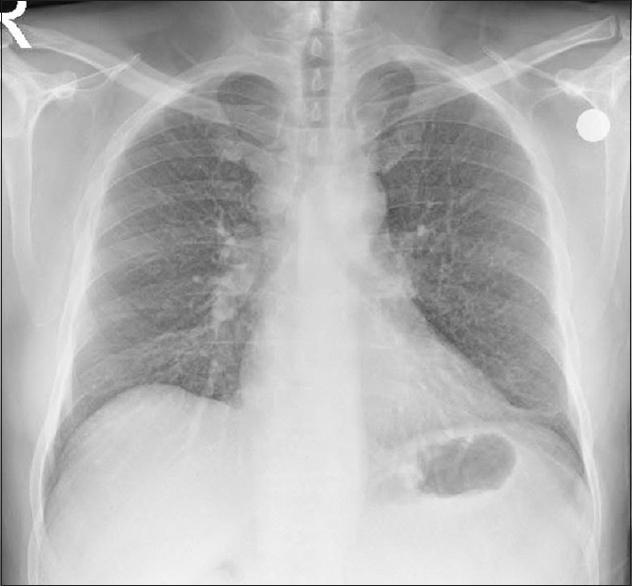 We report a rare case of 23-year-old Yamani patient admitted as an emergency with a 1-week history of productive cough, hemoptysis, and chest pain. 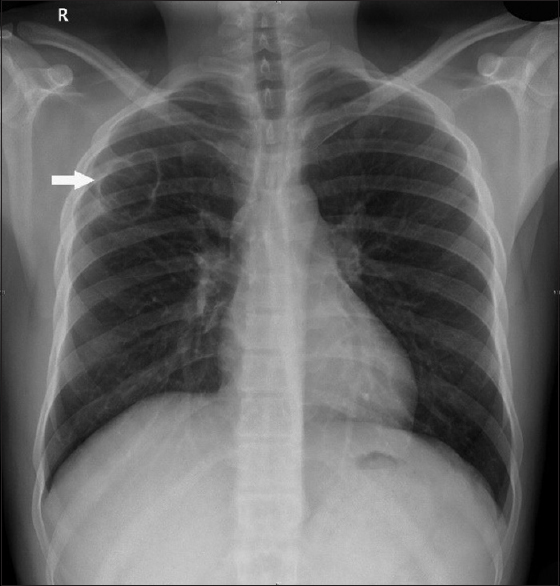 Chest X-ray and computed tomography scan showed right upper lobe peripheral abscess cavity. All routine blood investigations and interventions such as bronchoscopy and bronchoalveolar lavage failed to confirm the diagnosis. However, he underwent right thoracoscopy and excision of this abscess, which unexpectedly showed in the histopathology of the resected specimen Schistosoma parasite infection. 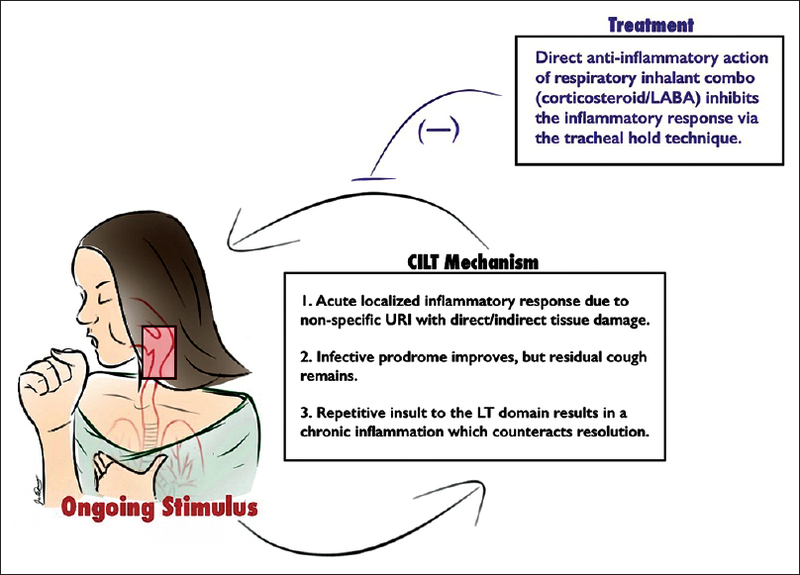 Chronic cough is associated with repetitive injury to the upper airway and trachea, which can lead to an underdiagnosed pathology known as “cough-induced” laryngotracheitis (CILT). In this report, we describe a case of CILT that responded well to dual therapy.